Chris Wright recalls working in the Selmer Factory from 1963 to 1966. I joined the Theobalds Road factory in Holborn, London as a 17 year old junior test engineer in 1963 prior to John Weir and John Crocker joining, left, and then returned (after a few months working at Burns in Romford) in late 1964. I worked in the test room with Ron Fowler, and the two Johns for a few months before moving into development as a prototype wireman with John Hosey and Brian Davis. My job in development was to construct the prototypes and lay out the wiring ready for Production. When I first started at the factory, there was a Clavioline service room next to the test room and next to it was a Malayan craftsman called Sam who repaired and fettled a wide range of guitars. He was a jazz guitarist and could give a guitar the lowest fretboard action you've ever seen. He loved the old Les Pauls best. The room was always full of Gibsons, Gretschs and Hofners. He re-polished scratched finishes so that the guitars could be sold as new. What I can recall most about the factory is the sense of fun and the crazy exploits we got up to with Ronnie Lane and Len Caton, (a great guitarist who tested the amps with Ronnie in the "soundproof room"). That room was constructed out of fibreboard to cut the noise down because the production line complained. It had a Fender Strat and Precision Bass from the Charing Cross Road shop, to be used to do live-testing of the finished product. Kenny Jones was on the cabinet and speaker assembly line and Ronnie and Kenny were getting the Small Faces going. They got their first recording contract while I was there. 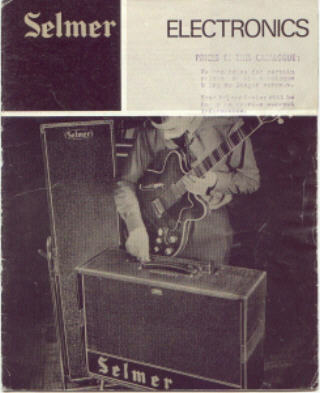 The most well known groups that used to come in at that time were Gerry and the Pacemakers, together with the Animals, (who used Selmer kit before they went over to Vox). The Factory was a politically incorrect and dangerous place by today's standards and Monica and Maureen, the secretaries from the factory office, had to "run the gauntlet" to reach the service department. Monica was old enough to give as good as she got, but young Maureen was constantly being embarrassed by Ronnie and the others laying in wait for her. She must have been a good sport. It wouldn't be tolerated today, that's for sure! Neither would the unprotected open solder bath introduced in the production area for the first PCB models, or the game of charging small capacitors in an amp and sellotaping them to door handles so that the next one through the door got a shock! Another trick was to throw them to someone who would involuntarily reach out to catch what was being throw to them, only to drop it with a curse! Then there was the "Rocket", made out of valve caps soldered together and fuelled by Swan Vesta match heads, that knocked a chunk out of the ceiling when they set it off. The Canteen served things like beans-on-toast with ciggie-ash! The lady who ran it had a cigarette constantly burning. Through the Canteen down to the Stores and Development, the corridor was over open space and really drafty as you could look through the gaps in the floorboards and see the ground below. I can't remember what the area below was used for, but it was definitely open space. There was a small workshop and drawing office in development, where an irascible draftsman worked. I can remember once we assembled a clear perspex version of a Zodiac for demo use and used chloroform as a solvent. I was found peacefully asleep one day on the floor in that little workshop, having accidentally breathed in the chloroform! It was a great place to work and I learned a hell of a lot there in a very short time. The job in the development was interesting as there were always suppliers coming in with new speakers and cabinets and components and the job was a mix of mechanical and electronic skills. More varied and exciting than working in the test department, I thought at the time. Generally speaking, I think Selmer build quality was better than what I've seen of early Vox's, and they certainly didn't suffer from the intense overheating of the AC30s. Folks at Selmer's were always upset that Vox gave away so many amps to big name groups, but it must have generated a lot of sales I guess. I left there in late 1965 or early 1966 to join IBM. As an IBM typewriter engineer, I visited Selmer in Braintree once and had a brief chat with John Wier there. I think he was the only one there I recognised from those earlier days. I haven't even thought much about Selmer's for years until I saw this web site. However, I was very sad when Ronnie Lane finally died from MS. He was a really great bloke.